This week’s lesson is about Salvation—the essence of what each of us needs because we are born dead in sin (Eph. 2:1-3). The overarching problem with this week’s lesson is that it does not explain “salvation”. 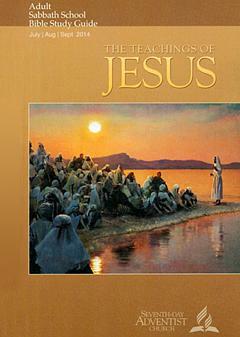 It goes through the gospels and attempts to show salvation through the parables and stories of Jesus. In order to understand salvation and the new covenant, however, one must study the epistles. For people who have a worldview that does not include depravity, natural spiritual death (of a real immaterial spirit), the subject of salvation has to be explained from the ground up, so to speak. Reviewing the entire process of salvation is necessary because Adventists don’t understand their own condition or what Jesus really did. This statement is wrong; death is not the result of “slavery to sin”. Rather, our natural condition as we come forth at birth is DEATH. We are born dead; we do not become dead because we sin. We actually sin because we are born spiritually dead. Ephesians 2:3 says we are “by nature children of wrath.” Our physical death is our natural end because of our natural spiritual death with which we are born. Truly, truly, I say to you, whoever hears my word and believes him who sent me has eternal life. He does not come into judgment, but has passed from death to life (John 5:24 ESV). The second sentence states unequivocally that a person who has eternal life will not come into judgment. That’s not a HOPE that they won’t be judged but an actual promise of fact. This is an unconditional statement, not a conditional statement. A person who has eternal life will not lose it as a reality when he dies. His spirit, which is born again of the Spirit (John 3:3-6) is alive with God’s life, and there’s no ending. His now-alive spirit will go on living. There is no such thing as “renewed spiritual life”. We are either spiritually dead or alive; there is not middle ground. We are either separated from God and His Spirit, devoid of life, or we are born again and indwelt by the Holy Spirit. We cannot lose our spiritual rebirth because when it occurs, the Father transfers us out of the domain of darkness into the kingdom of His beloved Son (Col 1:13). We don’t “start to enjoy, even partially, what it means to have eternal life” as the question at the end of Thursday’s lesson says. This statement reveals that Adventism denies the reality of spiritual death and life as it is given to us when we are born of the Spirit. When we are born again, we are changed, and God continues to grow us as we abide in His word. Once again, the point is missed. Sabbath does not prefigure eternal life in the sense of the new heavens and earth. It prefigures Jesus and His finished work on Calvary. It prefigures the miracle of the new covenant and life in Jesus. Sabbath represented rest in Christ. All man’s efforts to provide for himself had to stop on the Sabbath during the history of Israel. When Jesus came and died on the cross, the Righteous for the rebellious, when He rose from death and ascended to the Father, He fulfilled the shadow of Sabbath rest. He finished all that was required for salvation, and when we repent and receive His work on our behalf, we pass from death to life and end our struggles to be pleasing to God. The Sabbath was a shadow of Jesus and His finished work. When we cling to the shadow instead of to Jesus—or when we try to add Sabbath to clinging to Jesus—we are not trusting Him. We must give up our right to honor a created day instead of trusting Jesus ALONE for our salvation and obedience. Finally, please read Romans chapter 3 through 8. Ask God to teach you what He knows you need to know as you read from His Word. Copyright 2014 BibleStudiesForAdventists.com. All rights reserved. Revised July 21, 2014. This website is published by Life Assurance Ministries, Camp Verde, Arizona, USA, the publisher of Proclamation! Magazine. Contact email: BibleStudiesForAdventists@gmail.com.